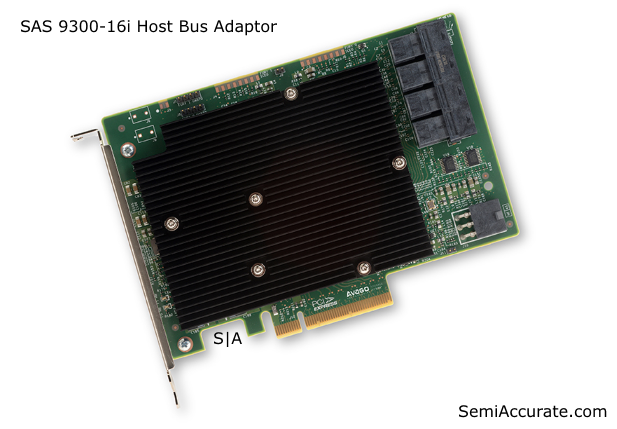 Back in Early December Avago launched a couple of new 16 port 12 Gb/s SAS Host Bus Adaptors (HBAs) to round out its 9300 series of products which also contains 4 and 6 port options. The new 9300-16i and 9300-16e HBAs are good for nearly 2 million IOPS of performance. For those counting at home Sandisk’s SAS 12 Gb/s SSDs top out at about 190 thousand read IOPS. This means you can hook up about ten or so SSDs before you saturate this HBA. And for those of you who aren’t counting and are just wondering what an HBA is, then the easiest way to describe it is to call it a storage array controller. The only difference between these two HBAs is their targets. The 16i model has its SAS ports on the far end of the PCB for use within a server chassis and the 16e’s ports are on the expansion slot bracket for external connections. Both require a six pin PCI-E power connector and slot into a PCI-E x8 or x16 slot. That’s convenient because they require eight PCI-E 3.0 lanes as a host bus to transfer data at their full potential. With a matte black single slot heatsink the Avago 9300-16i and 16e are passively cooled solutions and a chassis with good air flow is obviously in your best interest. Specifically these HBAs use Mini-SAS HD connectors and are 12 Gb/s SAS 3.0 compliant. They are also full height PCI-E cards at 4.4 inches tall and 6.1 inches long. As far as cable types go they support both passive copper cables and those fancy active cables with the 16i going so far as to support active optical cables. Avago rates their power draw at 27 Watts for the 16i and 28.6 Watts for the 16e, because apparently going outside the chassis requires just a little more juice. Both support up to a whopping 1024 Non-RAIDed drives and are rated for a mean time between failures of more than 2,500,000 or almost 300 years. So if one of these HBAs do fail you should probably be a little cheesed that you drew the short stick. As this is an enterprise solution there are a variety of operating system supported like Windows, Red Hat, Solaris, SuSE, and FreeBSD. With Solaris 10 Oracle’s even gone so far as to produce their own driver for Avago’s HBAs which is an interesting twist. 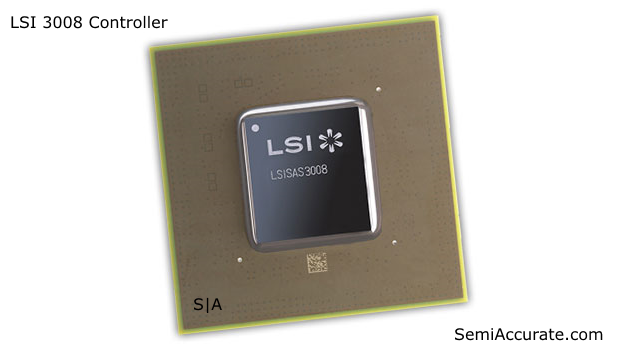 Avago uses their SAS 3008 controller on these HBAs courtesy of LSI. More interestingly this controller uses an off-the-shelf CPU core from IBM; the PowerPC 476FP. Running at 1.2 Ghz in these new HBAs, the 476FP core is a superscalar, 4-issue, 32-bit RISC unit that implements the 2.05 revision of the PowerPC ISA. It’s an out-of-order core with a nine stage pipeline and in-order completion. With 32 kB of L1 cache and a 3.765 mm2 physical size on IBM’s 45nm SOI process the 476FP is a pretty chunky little core. According to Avago they were presented with a variety of options when it came time to choose a CPU for this controller and ended up skipping over MIPS and ARM-based solutions because of the performance potential of IBM’s design. Although the company representatives we talked to were quick to add that they were always re-evaluating their options and would go for the highest performance solution above all else.